The McGill Shuttle Bus Tracker is a mobile-friendly website that uses Google Maps to show you the location of each bus along its route, and how fast it's moving. Zoom out if you don’t see any bus icons on the map. Click on the icons to find out the bus speed, and when the information was last updated. If you ride the inter-campus shuttle bus, you’ve probably found yourself waiting at the stop and wondering when it will arrive – especially in these frigid February temperatures. Now you don’t have to guess. The McGill Shuttle Bus Tracker is a mobile-friendly website that uses Google Maps to show you the location of each bus along its route, and how fast it’s moving. Zoom out if you don’t see any bus icons on the map. 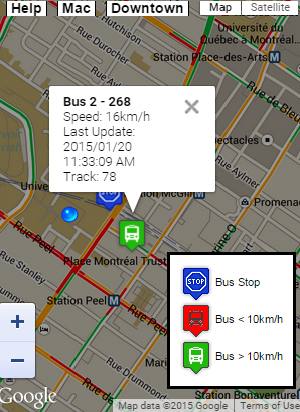 Click on the icons to find out the bus speed, and when the information was last updated. Find out more here.